I am a little overdue on posting about this cracking tasting. A colleague – Sara Guiducci – has done a far more in depth post on the C&B Blog but I wanted to get my brief notes down. I hosted the evening by introducing Andrea Franchetti who spoke and as well as ever with his own brand of savage honesty to the fore as always. Also for me it had quite a large overlap with this other Vertical in Oxford at the start of the year. 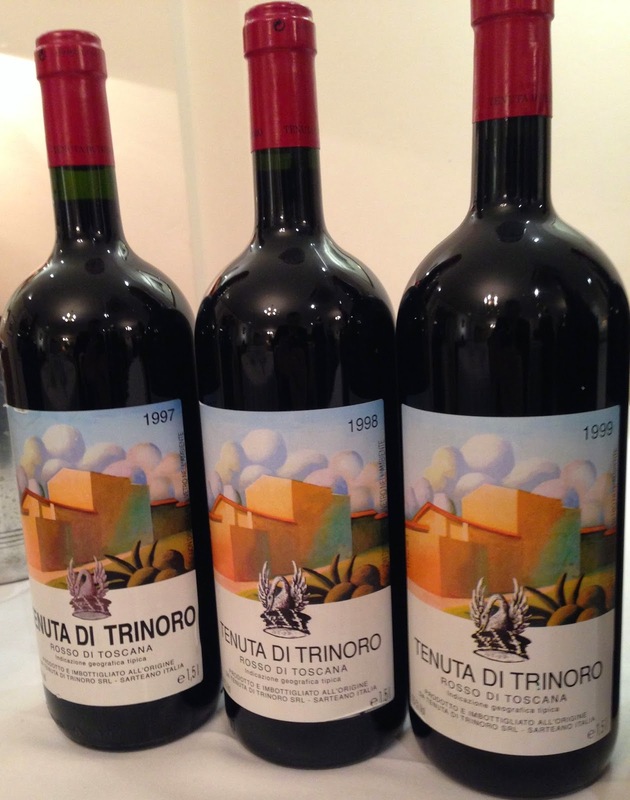 I won’t go into too much background but this tasting took us back to the very first vintage, 1997, although there was a wine (Cupole di Trinoro, now the name of the second wine) produced in 1995. Andrea made his way to creating wine via Bordeaux and his passion for Cabernet Franc in particular stems from a bottle of Petit Cheval 1990 he once had. The estate picks very late, even in November on occasions with 125-135 days of “hang-time” not unusual. As the tasters assembled we had a glass each of the Guardiola 2012 from Andrea’s estate on Etna. 100% Chardonnay but totally unoaked this is a wine I have enjoyed from the start but to be honest the 2012 is a serious step up on the good vintages before. It manages to be both unctuous and fresh, rich and delicious. There is considerable and enjoyable complexity to this wine. 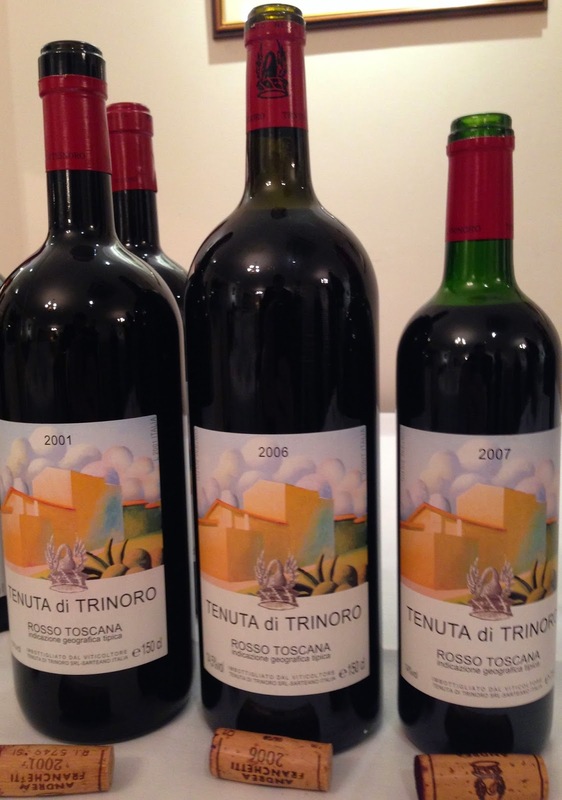 With that we started the reds and it was only the principal wine – Tenuta di Trinoro itself. All the wines were pre-poured and questions came along as and when. No fixed “flights” so to speak. A real favourite of Andrea’s, a “monster” was how he described it– red fruit, cherry and almost elegant on nose then bold and generous – it is a cracking wine of extremes. It fermented for about a year which is remarkable…overall there were 12 pickings of Cabernet Franc (the predominant variety in contrast to 2012). A hot year like they used to get…unique. This is a vintage I know quite well from tasting over the years. Until the 2011 came along I considered it the most extrovert of the Trinoros. A riper, higher toned wine than previously, but elegant and in balance, it now has an ever so slightly chalkily enticing palate…Andrea commented that it was an easy vintage (a little like almost all of Europe then!). “Dry leaves being raked” was Andrea’s comment as it was a very dry vintage. To my palate this was the one wine that may be showed less than I expected, it is slightly in an “in between phase”. Oak a little too obvious, high octane and opulent but in a more vegetal style. I’d love to re-assess in a couple of years. I can’t quite remember the context but there was a comment about the “Disease of ripeness” this had an exoticness, balance on palate, new leather with a refreshing greenness (I can never explain what I mean by this) – more corrupt but in a good degraded sweetness fashion! To use Andrea’s own words “The best I have made”. I asked around the room at the tasting and afterwards and if people were asked for 2 or 3 favourites then they all included this wine. It has a simply superb balance of sweet, slightly degraded fruit, tannin and a refreshing acidity, complete. This was a really interesting vintage, far gentler than many. Mellow notes of herbal water, cucumber water, a lightness, delightfully mature with some sweetness still. Drink and enjoy. “Smaller and neat” was Andrea’s comment. I found a little dark fruit then some mint and iodine. A savoury saline edge gave complexity. More masculine than the 1999. I really liked this. So the first vintage and from vines planted, amazingly, in 1993. 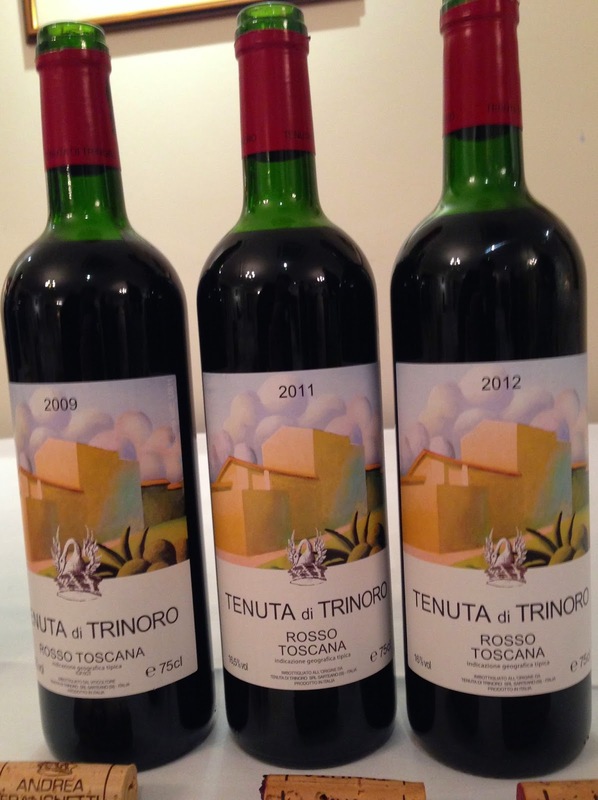 The vintage is one that in many ways put Italy on the modern fine wine map. This was mature but with some good dark fruit, Iodine showed as well, mellowness. Very good right now!